''Ang on boy, Joan's got sumfink to show yer.' She rummaged in a drawer for a moment, pulled out a piece of paper and handed it to me. 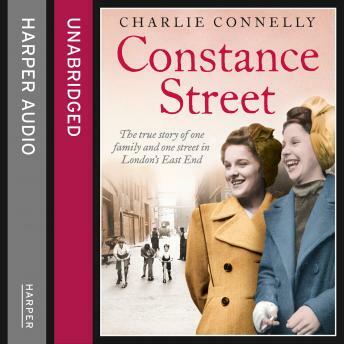 Through the story of one street - Constance Street - we hear the true life tales of a tight knit group of working class women in the East End of London set against a backdrop of war, hardship and struggle. It's a story of matriarchy and deep family ties, of a generation that was scattered away from the street during the blitz bombings, but which maintained the ties of that street for decades afterwards. Set in an area of East London called Silvertown, a once thriving docking community that at the turn of the 20th century was the industrial heartland of the south of England; the story focuses on the lives of 12 incredible women and their struggle to survive amidst the chaos of the war years. We have Nellie Greenwood, the author's great grandmother who runs a laundry in Silvertown which becomes the focal point of the community. In 1917 a munitions factory in Silvertown explodes flattening much of the surrounding area and causing extensive damage to Constance Street - Nellie's daughter is blown from her crib but miraculously survives. Through the Great War, the roaring Twenties, the Depression and then the unimaginable - the outbreak of a second world war - Nellie and the street survive with love, laughter and friendships that bind the community together. But just as this incredible group of women live through the worst, the unthinkable happens. On 7 September 1940, Constance Street is no more.